Kettleworx has taken the kettlebell workout craze and used the popularity of this fitness tool to develop and market their own six week program. I saw the Kettleworx infomercial video for the first time the other day. Since people have been asking me about kettlebell workouts, I decided I would review the Kettleworx program. Before I review the kettleworx program, for those that don't know, I'll get into what the kettlebell is, and a bit of it's history and it's rise to popularity. The kettlebell is an off balance implement that makes exercising with it a bit of a challenge. In it's most common form, it looks like a canon ball with a handle. It's a challenge to exercise with a kettlebell because it is not balanced like a traditional dumbbell or barbell. Using an off balance implement like the kettlebell in your workouts is like standing on one foot, your body is required to work harder to balance itself. The kettlebell originated in Russia. In small villages it was used by strongmen to entertain and to show off feats of strength. The Russian military realized that it would be good to use it for training soldiers because it was inexpensive to make, yet useful to improve fitness levels. It was basically just a chunk of iron with a handle that the men could swing and throw around to develop their fitness, strength and conditioning. About 11 years ago, a Russian fitness instructor by the name of Pavel Tsatsouline began to popularize the kettlebell as a fitness tool in America. Since then, clever marketers in the fitness industry have taken this chunk of iron with a handle, and have milked it as much as possible. A 20 pound kettlebell can range anywhere from 30-50 dollars. It's working out nicely for those that sell kettlebells. With a brief explanation and history of the kettlebell out of the way, let's get into the Kettleworx review. Before I watched the Kettleworx informercial, I kept in mind that most, if not all infomercials have three things in common. They overhype, blatantly mislead, and their products under deliver. I hate giving negative reviews, but unfortunately, Kettleworx was not much different than most infomercials. Let me start with the Kettlworx claim that using their program is going to "sculpt lean muscle". No fitness implement or workout program will sculpt lean muscle. Muscle is a type of body tissue and unlike clay can not be sculpted. Muscle either gets bigger (hypertrophy), or gets smaller (atrophy). Sorry Kettleworx, but you fail with this claim. That is unless you're going to include a scalpel and a plastic surgeon with the program. Another Kettleworx claim is that cardio, core, and resistance is all done in one workout and they imply that this is exclusive to the Kettleworx kettlebell program. Believe it or not, you don't have to buy an overpriced fitness implement like the kettlebell or purchase Kettleworx to achieve a cardio, core and resistance workout all in one session. If you've read my articles on cardio and have done either the Fat X Program or some of the free workout videos from the Bonus Fat Burning workout Series, you already know this. Kettleworx seems to be marketing their kettlebell program to beginners, but they also state that their six week program includes over 200 exercises and 36 workouts. In my opinion, that is way too much, overkill and unnecessary. I'm a big believer in quality, not quantity. Beginners as well as advanced trainees can actually do better with learning, relearning and using basics exercises in properly set up and adjusted workouts. Complexity is not a necessity to get good results. Amazon users give the Kettleworx six week program 3.5 out of 5 stars. I would only give it three stars. It will be a decent workout and it's better than doing nothing, but it is not worth the huge price tag. If you want to learn kettlebell exercises and include them in your workouts and fitness routine, I would actually recommend going with Pavel Tsatsouline's DVD. After all, he's the man when it come to the kettlebell! His DVD gets 4.5 out of 5 stars from Amazon users and I fully agree with that rating. Ultimately, you don't need kettlebells to get in an effective and efficient workout. My 12 Day Fat X Program has proven that. 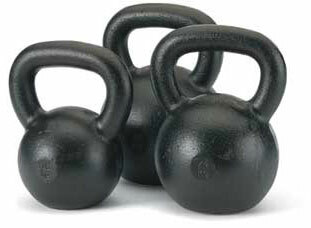 But, kettlebells an the exercises you can do with them can be a nice addition to your overall fitness toolbox. If you would like reviews on more products or programs, send me a message at CoachRollie@gmail.com.